Two page article– no date or publication known. 1994 November -December RAW (163) A 12 page pull-out feature on the Red Hot Chili Peppers with several double photos and articles including one on John Frusicante on his life following his split from the band. 2001 Guitar World Acoustic (43) (Sorry no transcript; I bought this as a present for a friend and scanned it before I posted it to them. Had the scans and thought I’d add them here so there is a back-up copy around). 2001 May Guitar World How to play several RHCP songs. 2006 July Guitar World 2006 A MASSIVE RHCP Section! Over 30 pages of interviews and photographs! Saint or Sinner: John Frusciante in-depth interview; John Frusciante’s guitar playing technique– Under The Bridge and Funk Brothers an interview with Flea about Red Hot Chili Peppers! 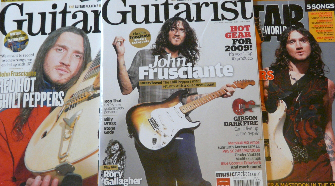 June 2011 Q 300th edition with retrospective look back at previous editions featuring a re-run of a 1999 interview with John Frusciante where he discusses his drugs use.